The first thing you see on the ground in Mozambique is "destruction", according to rescue teams from Doctors Without Borders/Médecins Sans Frontières (MSF), responding to the cyclone-hit areas in Beira, Mozambique, a port city with half a million people reportedly "90% destroyed". South African teams on the ground in Mozambique, aided by the South African Air Force. Image credit: IPSS Medical Rescue/Paul Herbst. Doctors Without Borders/Médecins Sans Frontières and the International Red Cross immediately launched emergency responses to the ongoing disaster, as more rain continued to fall over the hardest hit areas this week. Amnesty International is calling on foreign governments, including regional leaders, to ramp up efforts and resources available for rescue efforts. The organisation said the focus should be on saving people who are still trapped in the affected areas and ensuring that humanitarian assistance is provided to so that people’s basic needs are met and their human rights are protected. Tropical Cyclone Idai, which hit Mozambique, Zimbabwe and Malawi across Southern Africa, a week ago, has been described by the European Union Joint Parliamentary Assembly, as possibly the “worst weather-related disaster to have hit the Southern Hemisphere”. Wind speeds of over 200 km per hour and storm surge floods of up to 6 metres have caused incredible devastation over a huge area. 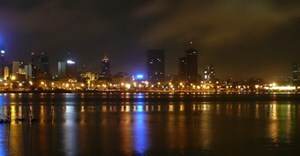 Mozambique Government officials have said they expect the death toll to surpass more than 1,000 people in Mozambique alone. Despite conditions at Beira hospital, Ministry of Health staff have treated more 1,500 injured people - a clear indication of the intensity of the situation. MSF teams responding to the cyclone in Mozambique, Malawi, and Zimbabwe, are reporting that, “based on what our teams are seeing so far, a significant emergency response will be needed, including medical services and water and sanitation support”. Additional MSF staff are en route and expected to arrive in the region by the weekend. Cyclone Idai hit Zimbabwe and Mozambique between 14 and 16 March. The powerful cyclone was predicted by the South African Weather Service on 11 March. Hundreds of people remain trapped in the cyclone-hit areas, while some are still unaccounted for. Mozambican president, Filipe Nyusi, has said that the death toll could be as high as 1000. Zimbabwe’s eastern Chimanimani district and Mozambique’s Beira are among the worst hit. According to latest estimates, 1.7 million people have been affected in Mozambique, over 920.000 in Malawi and over 500.000 people are affected in Zimbabwe. “The Southern African Development Community and the international community must provide the necessary resources to aid rescue efforts in the countries hit by Cyclone Idai in order to save lives and provide relief for those who have lost their homes and livelihoods,” said Muleya Mwananyanda, deputy regional director for Amnesty Southern Africa. Gert Verdonck, MSF emergency coordinator in Beira, Mozambique, said the following on Tuesday, 19 March, about the situation: “The first thing you see when you arrive is destruction—and a lot of water. We hear that the situation outside the town may be even worse. But in the limited time since we arrived, we’ve focused on trying to understand the situation and needs in this city, as there are some 500,000 people who live here and most houses are damaged or destroyed. “The water system is out of service, so there are large areas where people are really finding it difficult to find sources of clean water. Especially in the most densely populated and poorest neighbourhoods. It is still raining hard. I am sure it is going to be a while before the water recedes. “It’s difficult at this stage to have a clear picture of the medical needs. Actually, it’s even difficult to get to the health centres, because the roads are destroyed or because the health centres themselves are destroyed. I think that’s our biggest challenge right now. And it’s also a challenge for the Ministry of Health, which is trying to re-establish health care as quickly as possible. “Waterborne disease is certainly a worry here. People are using well water with no chlorination, and that water is unlikely to be clean and safe to drink. Those with more money can still buy bottled water, but not everyone can afford this. It is still raining right inside people’s houses, so pneumonia and other respiratory diseases are going to be a problem. And many people have gathered in schools or churches, where respiratory diseases can easily spread. 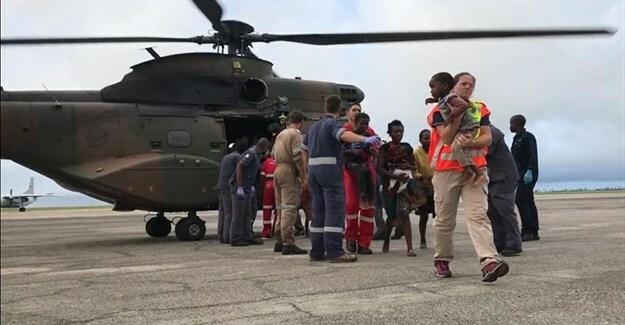 South African rescue teams were among the first on the ground in Mozambique to aid rescue efforts. Outside of Beira, Mozambique, a dam collapsed on 17 March, reportedly causing extensive damage. People reportedly sought refuge on the tops of their roofs and trees as rising floodwaters swept through the area. Initial aerial surveys indicated significant loss of life, although exact numbers of people impacted are not yet known. In Manica Province, Mozambique, there are reports of thousands of people affected by flooding and many areas remain inaccessible, making it difficult to identify the scale of impact and needs. A bridge has reportedly collapsed, isolating Dombe and Munhinga, in Sussundenga, from the rest of Manica province. Beira City remains cut-off from surrounding areas four days after the Cyclone hit, with the N6 national road between Tica and Nhamatanda (85 kilometres from Beira) impassable. Parts of Beira Port – including the grain terminal, warehouses and coal terminal – sustained damage. However, the container terminal and oil terminal did not sustain any major damage, according to preliminary reports. Several vessels ran aground near the Port and salvage operations are underway to clear the area. Early UN estimates were that 600,000 people are affected in Mozambique and 900,000 in Malawi. As the effects of Cyclone Idai continue to wreak havoc in Eastern Zimbabwe, the International Rescue Committee is responding in the hardest hit areas to address the massive need caused by the worst natural disaster so far of 2019. Cyclone Idai, which hit Zimbabwe on the evening of March 15, has caused massive flooding and landslides, forcing many Zimbabweans to flee their homes and seek higher ground to survive. Some areas have been cut off due to roads and bridges being swept away, and many who need help are unreachable by rescue and evacuation teams. Most of Chimanimani district is only accessible by helicopter, but poor weather conditions have hindered access since the start of the week. The European Union has already taken action to respond to the dire situation: in addition to the EUR 250 000 immediately mobilised in initial humanitarian assistance, an initial emergency aid package was decided on 19 March 2019 on the basis of a needs analysis for a total of EUR 3.5 million (2 million for Mozambique, 1 million for Malawi, 0.5 million for Zimbabwe). Moreover, the Copernicus satellite system has been activated to further identify needs and help humanitarian partners and local authorities. Response and search and rescue efforts are underway in multiple areas. INGC is providing assistance to 3,800 families in accommodation centres in Sofala Province. WFP has begun distributions in Beira and multiple health partners are supporting urgent response in impacted health facilities, including Beira Central Hospital. Outside of Beira, response is ongoing in Zambezia, including to contain the vaccine-derived polio outbreak which was confirmed in January 2019. In Tete City, WFP is assisting nearly 900 families affected by flooding with a mixture of cash transfer and vouchers assistance, at the INGC accommodation centre in Matundo neighbourhood, involving local food retailers. The UK will provide up to £6 million of UK aid to support the victims of a devastating cyclone and torrential rains which may have left more than a thousand people dead in Mozambique, International Development Secretary Penny Mordaunt announced 18 March. The UK expects to send tents and thousands of shelter kits to Mozambique on 19 March. UK aid is also supporting the World Food Programme (WFP) to feed 130,000 people for two weeks in Mozambique by distributing emergency food and food vouchers for people to use at local markets. In Malawi, UK support will help the WFP provide cash transfers so that 140,000 people can feed themselves until the end of March. Government of India has decided to divert three Indian Naval Ships (INS Sujatha, INS Shardul & INS Sarathi) to the port city of Beira to provide immediate humanitarian assistance and disaster relief. The ships will provide relief material in the form of food, clothes and medicine to the affected people. In addition, the ships have three medical practitioners and five nurses to provide immediate medical help. The IRC has deployed medical staff and supplies to Skyline in Chimanimani, Zimbabwe, where a mobile clinic has been set up to support those displaced by the disaster. The IRC is also supporting those displaced with food and kits for women. Norway is now providing NOK 6 million in humanitarian aid to those affected by the cyclone, and will consider providing additional support. Norway’s support is being channelled through the World Food Programme,’ said Norwegian Minister of Foreign Affairs Ine Eriksen Søreide. The immediate effects of this natural disaster will be felt for months to come. Paolo Cernuschi, Zimbabwe country director at the International Rescue Committee, explains: “Our teams have been on the ground since Monday supporting the response in Chipinge [Zimbabwe], and are on standby with emergency supplies to immediately deliver assistance to the most affected district Chimanimani as soon as access is restored. “While immediate lifesaving support is the most pressing need, the impact of this cyclone will continue to be severe in the coming weeks and months. We are expecting the situation to worsen and to see a surge in malaria and other water borne diseases. Further, this disaster compounds an already dire situation as the hardest hit areas were facing severe food insecurity and economic hardships prior to the cyclone. Sources: APO Group; Médecins Sans Frontières; Amnesty International; United Nations; UK Department for International Development; India Ministry of External Affairs; International Red Cross; International Rescue Committee; European Parliament; World Food Programme.